Nukkad Shops offers a one-stop solution for managing every aspect of your business – billing, inventory management, customer engagement, purchase & sales management and much more. Our business is to grow yours. The POS software is smart for a reason! The POS provides up-sell and cross-sell suggestions based on buyer behavior and previous purchases. 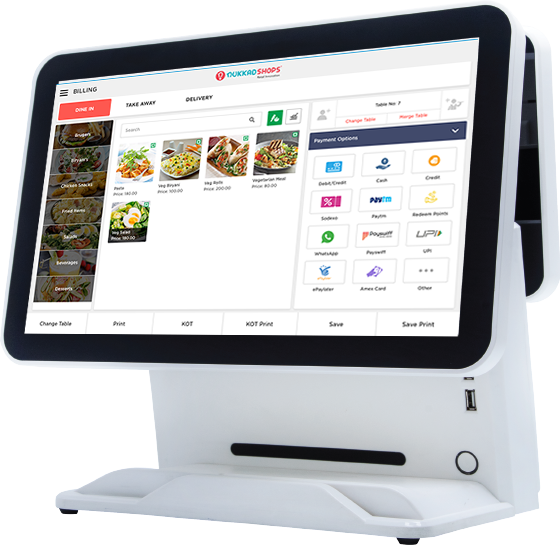 The POS solution is designed to help retailers increase their revenue through better customer retention, personalized sales suggestions and alternative revenue methods built into it. Nukkad Shops provide the whole ecosystem for retailers to become digitally independent and as part of this, it provides smart point-of-sale devices, printer and software through which the owner can monitor the inventory, the purchaser will get a list of items available in the shop and the whole billing system becomes seamless. The champion of small stores. Hyderabad based Nukkad Shops wants to get kirana shops back into reckoning. The fast disappearing neighbourhood "Kirana" stores, an interval part of the Indian middle - class lives, is back in the reckoning. The neighbourhood grocery shops are often low-tech and pretty unorganised. Nukkad Shops aims to provide hi-tech weaponry to them to fight back against the well-funded megaliths that the mobile grocery giants are becoming.